in the big / medium-sized buildings of private or public companies. 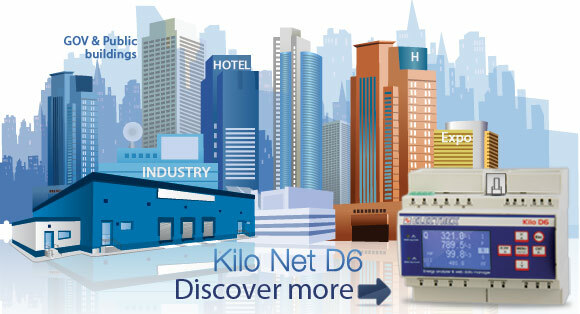 The Kilo net D6 Q is characterized by an open platform, high performance, reliability and various connectivity possibilities (Ethernet, Wi-Fi, RS485, E-Wi, NFC, etc.). 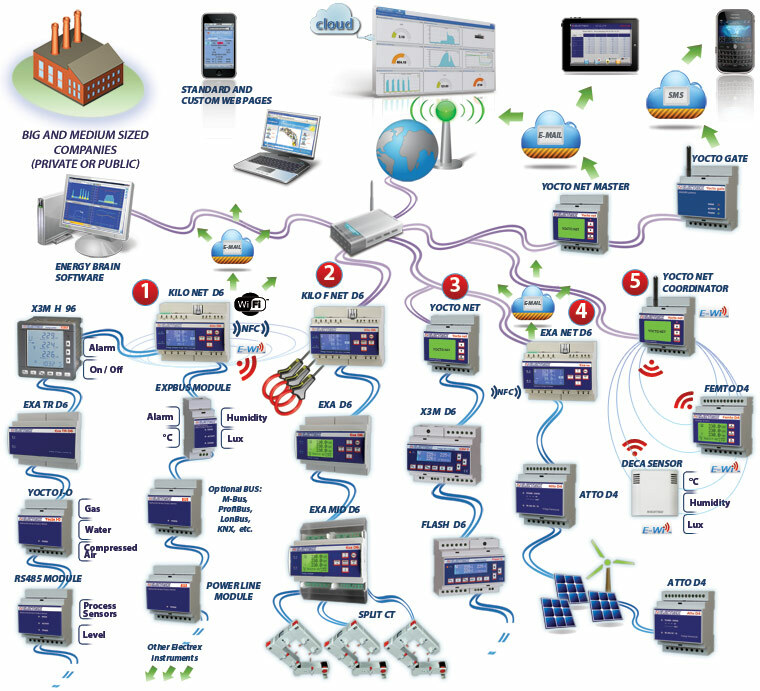 In branch 4 the Exa Net D6, in addition to measuring the production of the photovoltaic system and sending email alerts to the contact person in case of malfunction, acts as a gateway for the Atto D4 DC that control the production of strings. In branch 5 an Yocto net coordinator E-Wi manages a wireless Femto D4 E-Wi which monitors the energy consumption of the offices and two Deca Sensor E-Wi monitoring the internal and external environmental parameters (temperature, relative humidity and luminosity). 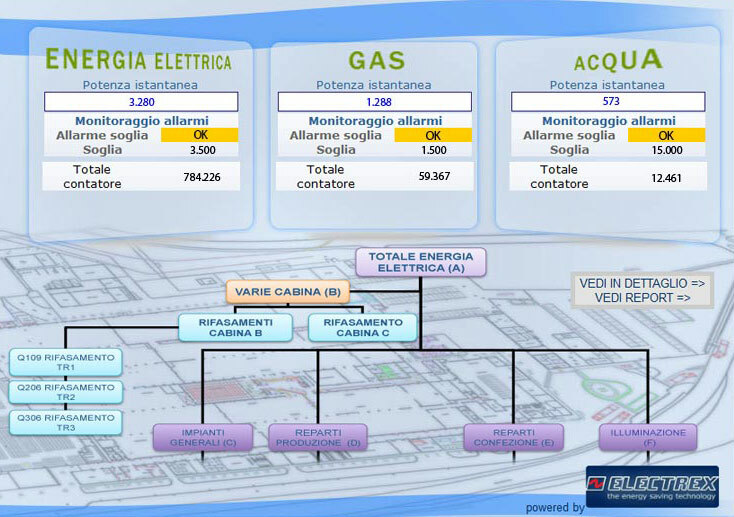 The Energy Brain software collects and automatically records the measurements of the energy carriers, of environmental and process parameters from the various gateways, instruments and sensors in order to support the persons in charge for the Energy Management System (Energy Manager / EGE) in order to keep under control parameters relating to the Indices of Energy Performance (ENPI or KPI) and allow benchmarking activities. 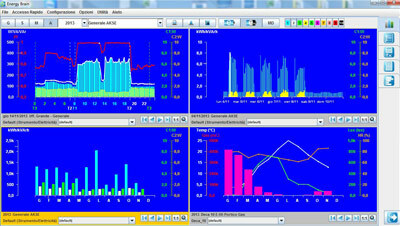 The web pages and the notifications / alarms are used to support engineers / maintainers. While the Energy Brain Cloud is used by managers / directors of various sectors that can display on their tablet, smartphone and PC, after authenticating with ID and password, a customizable dashboard with information on the specific interests.